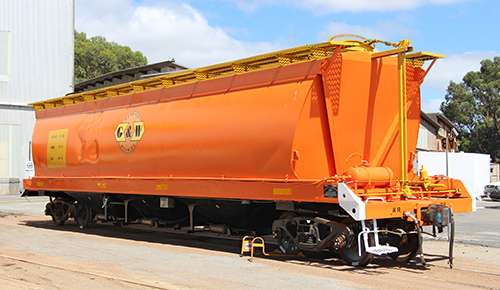 There have been two separate occasions when AHGX class grain hoppers have been converted to narrow gauge and used on Eyre Peninsula: from 1992 to 2001, and then from 2017 onwards. 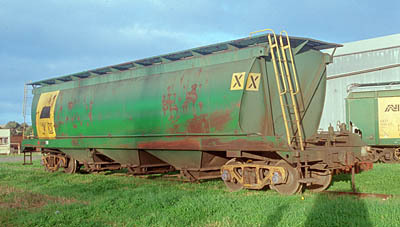 The 'standard' bogie grain hopper on South Australia's broad and standard gauge lines was the AHGX class (SHBX class prior to 1979). 132 were built: SHBX 1-52 for the standard gauge which opened in January 1970, the remainder in 1979-83 with 53-72 being issued as SHBX and 73-132 as AHGX. 101-120 were briefly coded AHGY, but all 132 eventually were coded AHGX. 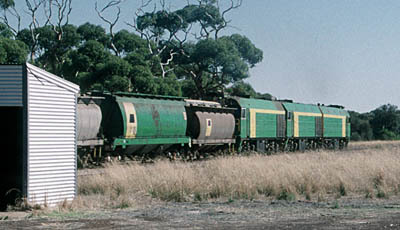 Three of these vehicles (86, 96 and 102) were converted to narrow gauge and sent to Port Lincoln on 14 Jul 1992. Following trials, seven more vehicles followed (104, 111, 115 and 121 on 7 Oct 1992, and 55, 69 and 74 on 15 Oct 1992). They were re-coded ENHB while on the narrow gauge (86-121 on 7 Nov 1992, 55-74 on 9 Nov 1992), but retained their AHGX numbers. If loaded to their full capacity, the ENHBs would have been far too heavy for the tracks on Eyre Peninsula. Another consideration was their relatively high centre of gravity which was a potential problem on the less-than-ideal track. Consequently all the hatch covers apart from the centre hatches were bolted shut so that they could only be partially filled. 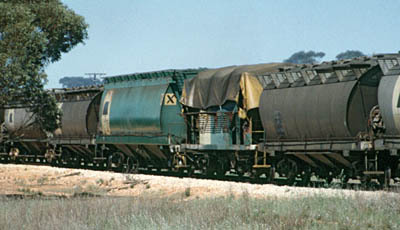 They operated this way until September 2001, when transfers of the XNW hoppers from Western Australia allowed the ENHBs to be returned to standard gauge operations. All ten ENHBs had left Eyre Peninsula by October 2001. Interestingly, 31 of the 132 AHGXs were converted to narrow gauge and recoded AHGF in Western Australia in early 2006. Three of this group had also been on narrow gauge on Eyre Peninsula: ENHGs 74, 86 and 121 became AHGFs 34150, 34154 and 34166 respectively. Following failures of the HAN and HCN hoppers under load in 64-hopper trains, it was decided to convert GWA's remaining fleet of 31 AHGX hoppers to narrow gauge and replace the HCN hoppers entirely. A strengthening modification for the HAN type allowed them to continue in service. AHGX 15 arrived in Port Lincoln on 14 Dec 2016. It was set up for narrow gauge operation and given a full repaint into GWA colours. It retained its AHGX classification. After a successful test run to Cummins on 16 Feb 2017 the rest of the AHGXs followed, arriving in Port Lincoln between June and December 2017. Since the first group of AHGXs was on Eyre Peninsula (1992-2001) the AHGXs have been fitted with air-operated bottom discharge doors. To ensure that the auxiliary reservoirs on the hoppers are charged prior to unloading, the AHGXs are always marshalled in a block at the Port Lincoln end of the grain train. This allows them to be connected to the main reservoir pipe on the locos.